Anyone who is seeking or following a healthy vegetarian diet should have this natural nectar everyday. 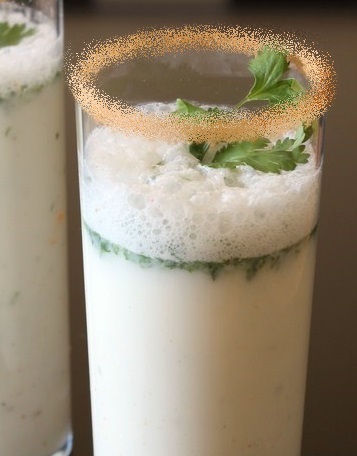 One of the best health drinks to have at all times and especially with meals is buttermilk (known as chhaaj or chhaas in India). Take one to two tablespoons of homemade yogurt. Add one glass of water to it. Add some cumin powder and salt to taste. Stir well and sip slowly. You can have this along with your meal or after a meal. You could also have this as a refreshing drink or as a snack substitute. It is also a very good post exercise drink. It also gives the feeling of filling up your stomach fast and works very well if you want to control your diet. Use it between meals to substitute snacking. It also satisfies you and reduces the urge to have alcohol and soft drinks. So try this natural nectar. Regularly having fresh homemade buttermilk or chhaaj starts bringing about some very positive changes even at the cellular level. Needless to say, it is also very good for pregnancy and weight management. So start making and having this wonder drink at least once a day.